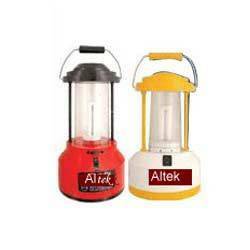 These attractive Battery Lantern are best in quality and highly efficient in working. These solar lights are offered to the consumers in safe packaging and at lesser cost. Solar lantern with 12v interface, 12v/10wp panel and a 12v/7ah battery.This lantern is as per specification ofmnre. Additionally can also besupplied with an ac adaptorand mobile charger on request.Backup of 35-40 hours. ERD presents Rechargeable LED Lantern. Once charged full it gives you light that is more bright & glows for more than double hours than an ordinary lantern. Like any ERD product this Lantern also stands for high quality, easy use & truly long life. - 12 Ultra Bright White powerful Big LED's Bulbs. Engaged in offering a wide gamut of Solar LED Lantern. Provided with a re-chargeable zero maintenance battery, these lanterns have a long lasting life. Provided with a base to put it on the table or floor, the battery and charge controller are housed in the cabinet. These Solar LED Lanterns are also customized according to our customers given specifications and requirements. We are engaged in offering a quality approved range of Emergency LED Lights.